Bids closed in December on Town of Pelham land sale: Now what? Part of the Town of Pelham’s original plan for funding its new community centre was to obtain a $15 million loan from Infrastructure Ontario (through Niagara Region) which the Town said would be a short-term “construction bridge” loan. According to the Town, this $15 million would be repaid soon after the community centre’s completion, and thus did not need to be included in its long-term debt calculations. The land is in immediate surroundings of the community centre, excluding the storm pond on the corner of Highway 20 and Rice Road. The Town has repeatedly asserted that the land is worth between $600,000 and $800,000 per acre. Last summer, Mayor Dave Augustyn said that the Town was using the low-end of the range, meaning that the land was worth just under $12 million. At the time, a local realtor consulted by the Voice said the $800,000 was “a ridiculous figure,” and that with considerable vacant real estate in East Fonthill it was difficult to believe that the true value of the land would be this high. The Town has said that it is selling the land as serviced, and that it is expecting the buyer to reimburse the Town (in addition to the sale price) for the costs already incurred, including that of the storm water pond. MacDonald has declined to state how much the Town has spent on servicing costs for the acreage being sold, instead instructing the Voice to submit a Freedom of Information request. How is the land being sold? The Town hired Colliers International to market and sell the land. Colliers’ fee is a three percent commission on the sale price of the land, or $360,000 if the sale price is $12 million. Yes and no. It was always the Town’s plan to help finance the community centre by selling off extra land it didn’t need. But in 2016, Town CAO Darren Ottaway said that the Town would maximize revenue by gradually selling the land in small parcels. Despite this, the Town decided to sell all the land at once. Does the Town actually own all of this land? Yes and no. The Town owns all 18.5 acres, but the Allen Group, the developer with which the Town has long had a relationship, currently has an option to purchase 7.7 acres of the total 18.5. These 7.7 acres front directly on to Highway 20. This option gives the Allen Group the ability to buy all or some of the 7.7 acres for $375,000 per acre, provided that a plan is in place for a retirement home or medical centre to be built on the land. The option expires in March 2019. 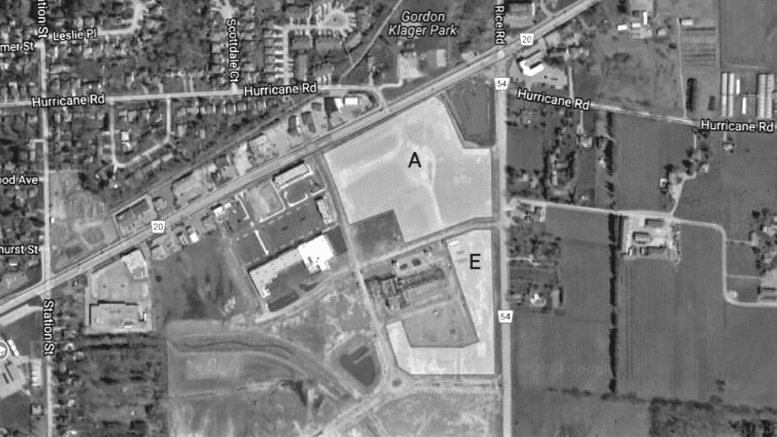 However, Town CAO Darren Ottaway has said that because the Allen Group must have an approved site plan before the option expires, the effective expiration of the option is about six months before March 2019—or September of this year. Wait—how can the Town be selling land that the Allen Group still has an option to buy? Ottaway said that the Town declared in the sale material that there is an option on the land, and that this is part of ongoing negotiations. He said also that a potential buyer suggested that the purchase be phased, in that the part of the land on which the Allen Group has an option may be acquired after the other part. Is Ottaway’s “irritant” assessment accurate? Perhaps. However, if the Allen Group exercises its option on all 7.7 acres, it would be able to buy this part of the land for just $2.9 million. This would mean that the Town would need to sell the remaining 10.8 acres for just over $840,000 per acre in order to recover the entire $12 million. According to Public Relations and Marketing Specialist MacDonald, “short-term financing will be needed for the March construction invoice,” since the Town currently has sufficient funds only for the next two weeks. If the Town is unable to recover the full $12 million from the sale of the land, the remaining amount of this “short-term financing” will become long-term debt. This would mean that the Town would have to finance the debt with operating revenue (i.e. property taxes) over a period of time. It would also push the Town closer to its annual debt repayment limit, and possibly prevent it from borrowing more money to fund future projects. Where is the sale process currently? Did you appreciate the information presented in this article? Help the Voice continue to do its job. Become a Member of the Voice today. Or consider making a donation.